Dr Judy Bradley has been appointed Professor of Physiotherapy at the University of Ulster. The academic from Desertmartin has focused her research work in the areas of respiratory conditions with a special interest in cystic fibrosis, bronchiectasis, outcome measurement and rehabilitation. The lecturer was presented the Award of Distinguished Research Fellowship by the University in 2004 in recognition of her contribution to research in the area of respiratory physiotherapy. She was subsequently promoted to a Reader at the University of Ulster/Belfast Health and Social Care Trust in 2005. She has contributed nationally and internationally to guidelines and consensus statements focused on providing recommendations for care. 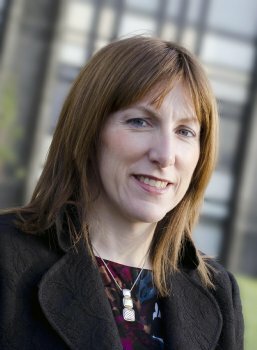 Professor Bradley took up her post of Lecturer Practitioner – a joint post by the University of Ulster and Belfast Health and Social Care Trust - in September 1998. A year later she obtained her PhD. She is an active member of several national Research Advisory Committees including the Cystic Fibrosis Trust and was appointed Chair of European Cystic Fibrosis Training Committee of the European Cystic Fibrosis Society in 2012. Professor Bradley plays an integral part of a Respiratory research team at BHSCT, which put forward an application to the HSC Public Health Agency Research and Development division to form a respiratory network. In 2007, Professor Bradley accepted the role of co-lead of the Northern Ireland Clinical Research Network (Respiratory Health). This role involves managing a very successful respiratory clinical trial research portfolio, which includes a large number of both pharmacological and non-pharmacological clinical trials in cystic fibrosis, bronchiectasis and chronic obstructive pulmonary disease and asthma. She provides leadership and direction to a multidisciplinary research team, which comprises of physiotherapists, nurses and a clinical physiologist a number of which have been trained to PhD level at the University of Ulster. Professor Bradley has published widely in her areas of expertise and has over 50 publications to date, many of which have been published in high impact respiratory journals. She has obtained funding from a variety of prestigious external agencies/pharmaceutical companies to undertake research and this research has had an important impact on patient care and service delivery. In the University, Professor Bradley is a senior member of the Centre for Health and Rehabilitation Technologies (CHaRT) and as such is working hard to increase the capacity of this research group. She is also involved in undergraduate teaching and in planning post-graduate modules.